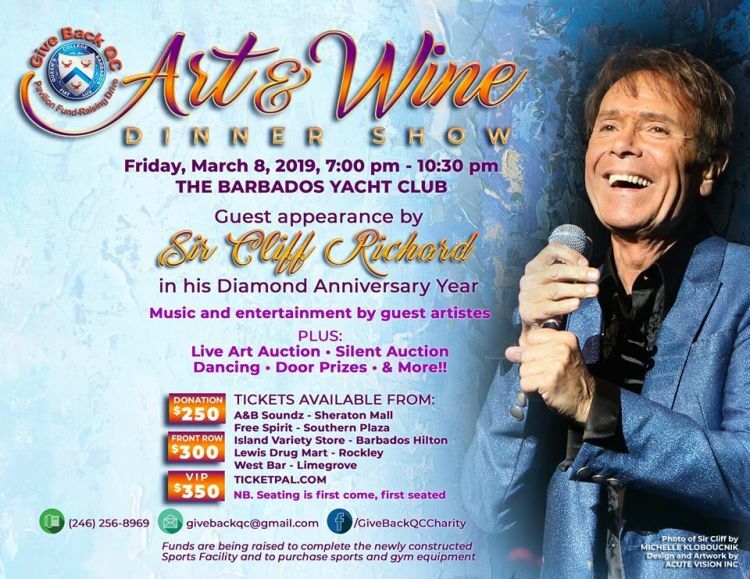 The Give Back QC Charity presents the 3rd annual Art and Wine Dinner Show with Sir Cliff Richard. Sir Cliff Richard, currently celebrating his 60th (Diamond) year in show business and has graciously agreed to make a guest appearance. Proceeds will be donated to the Charity towards the completion of the new Queen's College Sports Facility and to purchase sports & gym equipment. The Give Back QC Charity was established in 2013 and is an organisation charged with the responsibility for planning and developing effective fundraising programmes primarily for funding the construction of a Multipurpose Sporting Complex for Queen’s College. The structure remained uncompleted as a ruin, for the past 22 years and was demolished in April 2013. Several fund raising events have been staged to accrue funds to meet the estimated target of $ 1.2 million and enable the commencement of construction in 2015.